Getting the most from trains means maximizing the effectiveness of engineering, and one of the most important areas to get right is the wheelset. It consumes a high proportion of vehicle costs and is a demanding challenge to engineers. 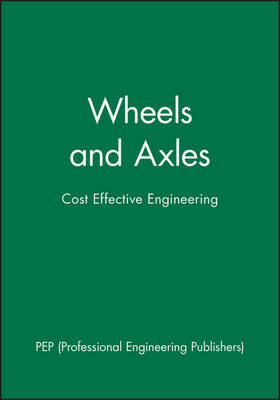 The papers presented in Wheels and Axles - Cost-effective Engineering continues the theme of wheelset safety, and looks at current developments to improve performance and cost effectiveness of wheels and axles, and their associated components. Topics covered include: - Development, design, and maintenance of tread profiles for improved life - The benefits of sanders - Improvements and developments in bogies and wheel materials - Soft issues of standards and data control - Wheelset data management Wheels and Axles - Cost-effective Engineering provides an essential update on topics that are vital to maximizing the return from wheelset assets. This volume will be invaluable reading both by those new to some of these basic concepts, and to the more experienced who wish to improve their knowledge.